El Dorado County Office of Education (EDCOE) Charter Adult Education programs offer instructional programs that touch adults wherever they are in their education or life circumstances. The wide range of educational options is especially beneficial for adult learners who have been confronted with life challenges. 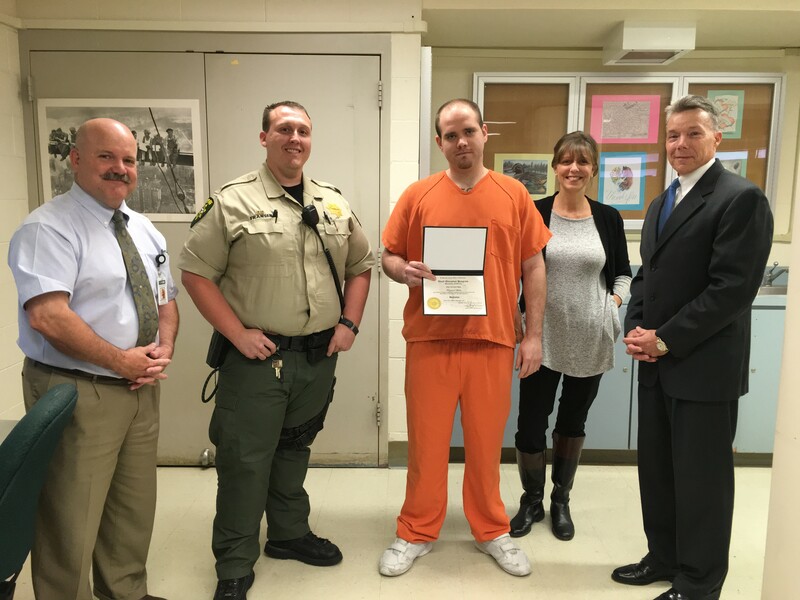 Raymond Martin, a current inmate of Placerville Jail, attends classes within the jail and recently celebrated a significant step in his rehabilitation by earning his high school diploma. Martin credits his accomplishment to the staff who have offered him support, including instructor Caroline Earl and Officer Robert Fransen, who checked in with Martin on a weekly basis and encouraged him to improve his circumstances. “Ms. Earl’s compassion for all of the inmates, and the opportunities the officers allowed me as part of this program, motivated me,” announced Martin during his recognition ceremony. Martin is one of the 60 students currently enrolled in the Adult Education program at the Placerville Jail. Approximately 20 percent of the inmate population receive individualized instruction to earn a high school diploma or a General Education Development (GED) certificate. Short-term Career Technical Education Certification and college-level classes are also available through the use of online courses. In addition to serving both the South Lake Tahoe and Placerville Jails, EDCOE’s Charter Adult Education Program provides educational opportunities at various sites throughout the County, including the Community Corrections Center, and English as a Second Language programs. A high school diploma is not the end of Martin’s time with Charter Adult Education. He has laid out for himself a series of parenting classes, college courses, and a path to learn a trade to improve his ability to start a career after his release. “I don’t want to live the life I’ve been living. I want to get a job, go to college, and be a better parent. As long as you set your mind to it, you can do it,” Martin encouraged his fellow adult learners. More information about Charter’s Adult Education programs can be found at http://aded.edcoe.org, or (530) 295-2291. Left to right: David Publicover, Officer Fransen, Raymond Martin, Caroline Earl, and Gary Sutherland celebrate Martin earning his high school diploma.